For the first time since the 2005 game against the top-ranked USC Trojans, the No. 8 Notre Dame Fighting Irish will host a top 10 affair as the No. 7 Stanford Cardinal come calling at Notre Dame Stadium under the lights on Saturday. The Cardinal are coming off of an improbable come-from-behind 38-31 overtime victory over the No. 19 Oregon Ducks on the road on Sept. 22. Oregon had a 99 percent win probability on two separate occasions in the second half, but the pesky Cardinal never gave up. Stanford trailed by 17 points at halftime, making it the largest halftime deficit overcome in David Shaw’s tenure as coach. 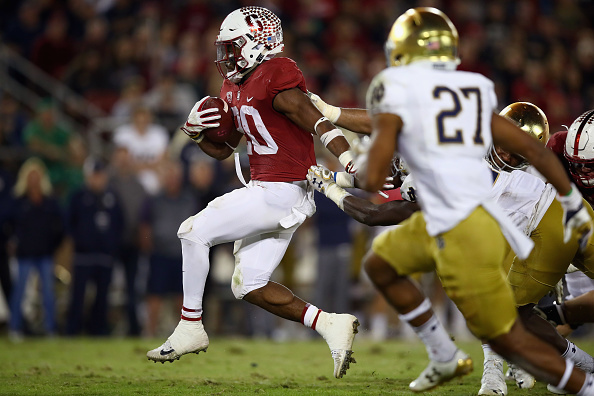 Notre Dame will need to contain Stanford running back Bryce Love in order to have a shot at winning. While Love is not on the same pace as he was last year, he is still having a strong season. In three games played this season, Love has 254 yards on 59 carries and two touchdowns on the ground, to go along with 27 yards on four receptions. K.J. Costello leads the Cardinal offense under center as a junior. This season, Costello has completed 73-of-114 pass attempts for 1056 yards and 10 touchdowns. Costello’s favorite target is JJ Arcega-Whiteside, a projected first-round draft pick in the 2019 NFL Draft. Whiteside has already accrued 408 yards on 17 receptions and seven touchdowns. In his second career start, quarterback Ian Book impressed the Notre Dame faithful in his season debut, completing 25-of-34 passes for 325 yards and two touchdowns in a 56-27 rout of Wake Forest on Sept. 22. Despite the performance, Kelly also was unwilling to commit to starting Book or Wimbush in his weekly press conference on Tuesday. Notre Dame also welcomes Dexter Williams back into the regular rotation in the backfield. Tony Jones Jr. and Jafar Armstrong have been splitting carries through the first four weeks of the season, while Williams was suspended. While no Notre Dame receiver has more than 167 yards worth of receptions on the season, the workload has been fairly evenly split. Four Notre Dame receivers— Miles Boykin, Chase Claypool, Chris Finke, and Alize Mack have all accumulated over 100 yards this season. Saturday’s contest could potentially have major implications on the College Football Playoff picture down the line. Notre Dame needs a win against the Cardinal to boost its resume with no conference championship game, as the Virginia Tech Hokies are no longer ranked in the Top 25 and their strength of schedule is rapidly deteriorating. Stanford still has Top 25 matchups against Pac-12 North foes No. 11 Washington and No. 24 California, both of which are on the road. Notre Dame leads the all-time series against Stanford 19-13. Stanford has dominated the series recently, having won each of the last three contests against the Irish and seven of the last nine.